Emerging from Life Stuff and a New Paperback! Wow, I’ve been away for a while. Sorry about that! Life sort of exploded on me and required uninterrupted attention to put everything back to normal, so the blog, my twitter, and my Facebook page all went lacking for love. It was a lot of slogging through unexpected things that all had to be done right-this-minute, mixed in with the Helvetican’s birthday, Halloween, nonfiction writing for the other half of my writerly existence, replacing my printer that died when Mercury slipped into retrograde, and topped by making a ball gown for the Princess in two days. 36 yards of tulle in six layers. Finished just in time for the dance. I’ll have to upload a photo of the dress because I don’t think the Princess wants to be on my blog. Yes, I am still reeling from the slight loss of sanity. But hey, now you know why I’ve been missing in action! New on the writing front: I pulled the ebook of Finding Refuge from wide distribution and went exclusive to Amazon for the next three months. This poor book has had a tough time finding an audience. It’s had great reviews, but sold poorly at Amazon, dismally at Barnes & Noble, and didn’t sell at all elsewhere. So, in a bid to jumpstart its visibility, I went for the exclusive. Also…Finding Refuge is now available in paperback! YAY! It’s so pretty, see? So far, it is available at Amazon and Barnes & Noble, but it should be up on Books A Million and other bookseller websites within a couple of weeks. Well, that catches us up to current on my side. Anything exciting going on in your world these days? 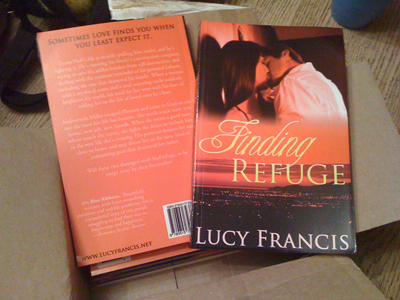 Kindle Romance Novels: Finding Refuge Hearts Redemption by Lucy Francis. 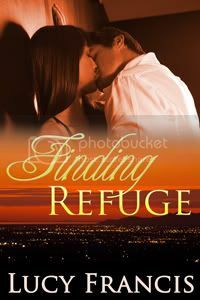 Yes, yes, this is a shameless plug for Finding Refuge, but I also wanted to give a huge shout out to Donna Fasano for maintaining the Kindle Romance Novels website and twitter feeds. She does a lovely job spotlighting new romance novels every day and giving them a publicity push. She’s also a best-selling author, so check out her page: http://www.donnafasano.com. READ THIS: The Business Rusch: Perfection « Kristine Kathryn Rusch. Yes, writers and other creators need to master the skills of their trade. We need to grow and improve, to study and to keep creating. But there comes a point when we have to be able to trust ourselves that the work is done. How many projects have you done that you have literally workshopped to death? That you have revised until it is polished but lifeless? That you have stored in a closet or on a hard drive because you fear that it isn’t perfect and will therefore never be good enough? I’ve done this so many times. And Ms. Rusch walloped me upside the head with a perspective that I sorely needed today. Read her blog. It will be so worth the time, I promise! I’m the featured author this week at Kindle on the Cheap and Cheap eReads! If you’re not familiar with these sites, you should be, especially if you’re on Facebook. They list free and inexpensive ebooks for the Kindle and the nook. I think the Cheap has another page that lists deals for Smashwords, Kobo, and Sony as well. They have pages that specialize in YA books, romance, even nonfiction. All books listed include the star rating and the genre as well as a link to the book. Check them out! Mending Fences reviewed by Romance Junkies! Okay, so the cold is hanging on, and a sore throat developed last night, six days into this craziness. Guess who’s off to the doctor? On a much brighter note, Mending Fences finally got a ‘review site’ review. As much as I love, love, LOVE the reviews readers have been generous enough to leave on Amazon and Goodreads, there’s just something about getting a look from a Reviewer, you know? This particular reviewer, at the Romance Junkies site, gave the book 4 Ribbons, which in RJ talk means “A book I would recommend to all my friends.” Yep, I’m a happy girl. Here’s the link to the review: Mending Fences. After a very long weekend (made longer by a nasty cold that developed. Don’t mind me coughing over here in the corner. ), I’m happy to report that all is momentarily well. Aside from the cold. What I mean is Mending Fences and Finding Refuge both successfully loaded and are available at Amazon, Barnes & Noble, and Smashwords. Other retailers are coming (I’m sure I’ve said that already), but the books should be available now in all the major formats. So, what’s on the agenda this week? I write nonfiction under my other writer hat, and I have an article to finish. Reclaiming my flower beds, which are once again choking with grass. Darn stuff. Weed barriers are useless against it. Reclaiming my desk. I should seriously upload a photo of what my out-of-control desk looks like. You’d be shocked that I manage to get ANYTHING done. Catch up on some reading. I have The Third Scroll by Dana Marton, The Book of A Thousand Days by Shannon Hale, and The Governess Affair by Courtney Milan as the next books to conquer on my TBR mountain range. Watch two movies coming out this week: Brave and Abraham Lincoln, Vampire Hunter. Soooo excited for both of them! What are your goals for the week? I’ll leave you with trailers for the movies, in case you’ve missed them. Mending Fences is now off the Amazon exclusive and is live on Barnes & Noble, hooray! Here’s the Link! I’m still waiting for Finding Refuge to finish processing on BN, but we will hope for resolution today. Where do you go to buy ebooks? Offer Mending Fences for FREE Thursday and Friday before it leaves the Amazon exclusive program. Release Finding Refuge on Amazon, Barnes & Noble, ARe, and Smashwords. It will launch on Kobo as soon as their new author portal goes live later this month so I can upload directly. I’ll also upload to Apple as soon as I can borrow a friend’s Mac. Also, Mending Fences will be available on those same platforms as of Sunday, June 17. Being exclusive to Amazon can result in great sales, but, having done it, I’ve concluded that I don’t like paying the price of not having my books available to readers at their choice of vendors, in their choice of formats. So, out of Select I go. Whew, that’s plenty to keep me busy this week. What’s on your schedule? The last week of major schoolwork is done, hooray! There are a few teachers here and there giving tests on Tuesday or Wednesday, but for the most part, everyone realizes that the teens are not going to be using their brains post-Memorial Day vacation and are not really scheduling much for the remaining two days of classes. This means I can stop worrying about pushing the kids along with school. Whew. I love the end of the school year! Now then, due to editing schedules and everything that goes into the end of prepping a book for release, the schedule for Finding Refuge has been pushed back a bit. It’s now slated for release June 14. Also, after having Mending Fences exclusive to Amazon for 90 days, it will be available at other storefronts and in other formats starting June 17. Finding Refuge will be launching wide also, it will not be an Amazon exclusive. The exclusivity thing can be very, very good for authors from a money standpoint. It’s very easy to boost a book’s visibility and the sales can be fantastic. Plus, when a book is available exclusively at Amazon, Prime members can borrow the book for free. Authors are paid for those borrows. So, honestly, leaving and choosing not to enter a book in an Amazon exclusive arrangement is scary. But I believe it’s the right thing to do. I want readers to be able to pick up my books in any format that suits them, without having to know how to convert or side-load or any other techie thing that’s required to read a book when you have something other than a kindle or a kindle app. My poor blog has been ignored lately. I feel terrible about that, I really do, but May is just One of Those Months, you know? Over the next three weeks, I have to keep my teens focused on finals and projects and myriad craziness that accompanies the end of the school year. Son #3 graduates high school two weeks from tomorrow. The week after that, son #1 returns from a two-year mission, and yes, I’m beyond thrilled about that. So, I shall try to stay current here on the blog, but if I slip over the next few weeks, don’t be terribly surprised. Now, on to news…I have a cover for Finding Refuge! The book, a contemporary romance, is loosely linked to Mending Fences. Some of the MF characters do show up in the new book, but both can easily stand alone for readers. Click on the Books link above to check out an excerpt. Finding Refuge is tentatively slated for release on June 1. Black Friday or Cyber Monday?